Get a classy looking mens black wool overcoat in a knee length and you will completely change your entire persona. Wearing an overcoat is always stylish and sophisticated whether you're wearing a suit or not. 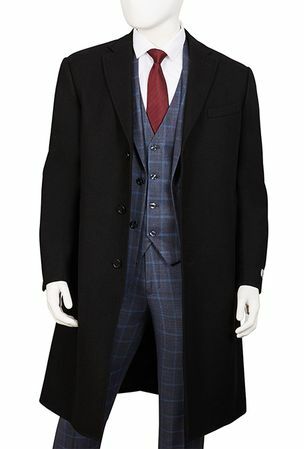 This black wool overcoat has a classic 3 button style that is knee length for that just right length. It has a center vent and is made of wool/poly blend fabric.